The stunning guitars will be produced in an extremely small run of just 25 examples. Lowden has introduced the Winter 2018 limited edition Tiger Myrtle acoustic. The guitar boasts Tiger Myrtle back and sides, paired with a Sitka spruce top. All guitars also boast the rare wood on the headstock, which is bound and inlayed with maple and ebony. Other features include a five-piece mahogany neck with rosewood splices, an ebony fretboard with bound maple and ebony binding and Gotoh 510 gold with ebony buttons. Lowden is producing just 25 Tiger Myrtle acoustics, available across models in their 35 and 50 series. 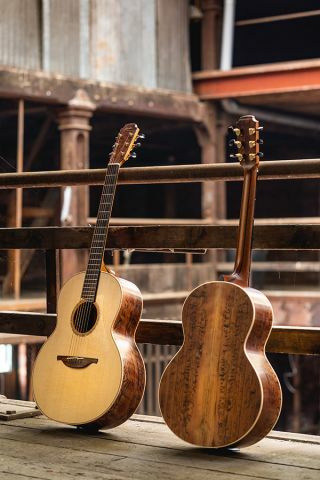 According to Lowden, “A ten-year search for this rarefied wood finally led us to these 25 sets of Tiger Myrtle, each one completely unique. The dark ‘tiger striping’ offers a stark contrast against the soft pink and orange accents of the myrtle." Head over to LowdenGuitars.com for more info.